What a show! What a magically, wonderful show! As I prepare to be the music director for CWorks’ winter production, I can’t help but to ponder on the meaning and the impact this script and music will have on all of us. First of all, the show is highly entertaining due to its rich characters, fabulous music and dancing, timeless humor, and deep cultural connections. It is also thought provoking and enlightening, covering themes such as family values, tradition, and antisemitism. I am a Christian, therefore I see everything in life through the lenses of my faith. From that perspective, I write this analysis of the content of this script. It is not exhaustive by any means. It simply reflects my own (limited) thoughts and pondering on the subject matter. In the fictional, Russian village of Anatevka, lives a milkman by the name of Tevya, along with his wife Golde and his 5 daughters. The story takes place at the turn of the 20th century, depicting life in a Jewish community coexisting with gentiles who, influenced and encouraged by the Tsar and a generalized antisemitic sentiment, persecute, drive away, and disperse the Jewish people living among them. While there are many aspects of this show that could be analyzed, my aim is to limit it to the traditions depicted in this story. I find them fascinating and worth thinking about. In Jewish communities there are discrepancies as to what is allowed or desired according to their religion. Much like Christianity, which has differences in denominations and cultures, yet has the same core system of belief across the board, Judaism has many faces and degrees of religiosity, while being united in common beliefs. This is not an analysis of Judaism in general, but a discussion on the traditions seen in this particular family and community of Anatevka. As far as I’m concerned, there are two types of traditions reflected in this story: Those ordained by God, and those made up by people. The script does not make a distinction between the two, but I think it’s worth mentioning the difference. The God-mandated traditions are the ones that were established in Scripture from the time of Moses. The ones designed by man happened through the years and have strong cultural roots. Jesus provides rest. This profound truth shows us that in our quest for salvation and in our desire to be right with God, man has always struggled to perform, do good, please a perfect God, and has always failed. Through religion, we cannot possibly reach God, because He is holy and we are not, he is perfect and we are flawed. All our efforts, in the end, are tiring and heavy. So when Jesus stretched out his arms on a cross and died on our behalf, He unequivocally declared that He, the only perfect sacrifice, paid the penalty for our sins. Therefore, we need to struggle no more. We can actually rest from trying to be right with God. We are right in Him. We now please God because we love him, not because we hope He will avert his wrath. It is the greatest of news! And it is most certainly true rest from our labor. JESUS IS OUR SABBATH. Match-making: Now here we see a tradition that is not mandated in Scripture. This is a cultural custom which in many cases has proven to be very practical (I guess?) Match making is at the center of this story, as one of the traditions that is upheld, almost at the same level of the other God-given laws. We see examples of matches being made in Scripture, but there is no law dictating it as the only way to marry. Tevya’s daughters go against this tradition by choosing their own husbands. Even though he struggles with this, Tevya goes along with their choices (at least with two of the three daughters), proving he is progressive and caring enough to break from his own way of life in order to support and love his family. Marriage: The topic of marriage is central to the story. Again, marriage is mandated by God back in the creation of Adam and Eve. It is the holiest of unions in the human realm and it is to be highly valued by God’s people. 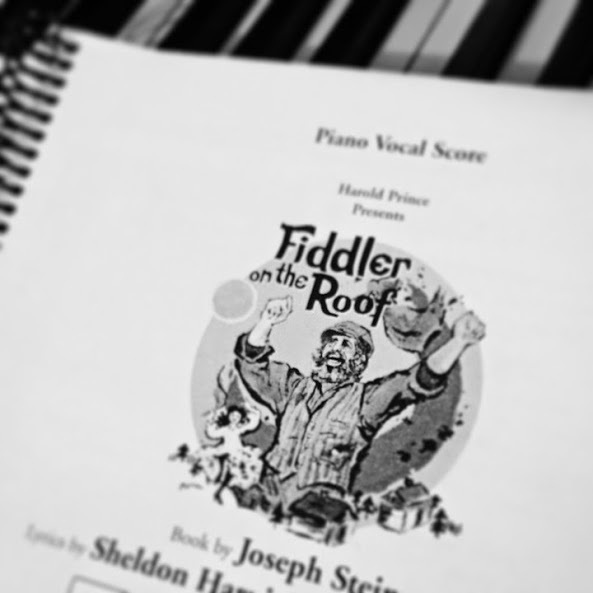 In Fiddler on the Roof, the issue of mixed marriages comes to light. We see in Scripture that God created all races and colors and He doesn’t have an issue with inter-racial marriages. However, it was clearly mandated to the Jewish nation that they were to marry within their own faith. Why? 1. To preserve the worship and the knowledge of God throughout the generations, and 2. Of course, to point to Christ. First, the Jews were the only monotheistic people group for thousands of years. They were the only ones who had the truth of God in their minds, hearts, and in the written law of Moses. They were to marry each other to preserve and advance this knowledge. In Christianity, we see the same principle at work. God calls us to not be unequally yoked (II Co 6:14). This inequality has nothing to do with race, education, or cultural differences, and all to do with our faith. Second, marriage points to Christ (Ephesians 5:22-32). More specifically, it points to the relationship between Jesus and his people (the church). What used to be a distant relationship between man and God, worshiping in a temple containing a big, heavy curtain for the purpose of separating man from God, has become a close, intimate relationship. Jesus has drawn near to us, opening the door for us to have access to God. Ephesians calls it a “great mystery”. I am very thankful for this reality. During this Christmas season, I am especially blessed by the knowledge that Jesus condescended and became a human, in order to be like me, make atonement for me, and have an intimate relationship with me. I am so thankful for the Jewish people. They have been the recipients of God’s covenant and love, as well as His law and prophets. In spite of persecution, dispersion, attempts of annihilation, and hatred, God has preserved the Jews and has been true to His promise. I am grateful for Jesus Christ, who was a Jew and fulfilled all the laws and the prophets. He has broken the divides that once separated the people of God from all other nations. In Christ, there is no longer Jew or gentile, male or female, master or slave. Salvation is equally available to all, through faith. There is no longer a need to strive to gain salvation, for He has done that for us. He is truly our rest. Aside from the conceptual analysis of the main themes of this play, I am beyond excited to be a part of it, simply because it is fun and entertaining. And, of course, the music is fantastic! In fact, I need to stop writing this oh-so-long post and get downstairs to my piano to finish studying the music. After all, auditions start tomorrow! If you live in RVA and want to see this amazing production, you can buy tickets here. Have you read the story? Tevya does not go along with his daughter’s marriage to a non-Jew. It’s more realistic (and understandable) for the time in which the story is set. She’s forgiven only when she comes homes and repents for what she did. I just mention it because I know many people don’t know how much that central part of the story was changed for audiences of the films and plays. Oh, and if you love Fiddler on the Roof, you might enjoy the biography of Sholem Aleichem, which you can find on Netflix.